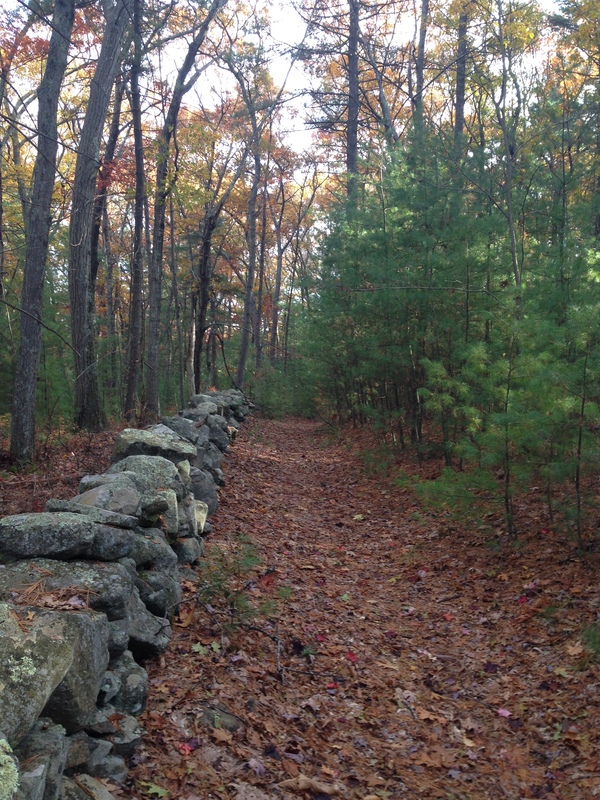 Over 35 years ago, we fell in love with 23 beautiful acres in Medfield, MA. A bubbling stream ran through the property. It fed a private pond and excited our imaginations. We dreamt of living there, in harmony with nature, and gave this dream a name – Harmony Farm. After purchasing the land, we began the process of manifesting our dream. Wanting to experience nature as much as possible from inside our home, we designed it with large expanses of glass facing south, which had the added benefit of passive solar energy gains. We built the house overlooking the pond. . A barn for some sheep and a donkey, then a coop for chickens came next. While erecting these buildings changed the land, we tried to do so in an earth-friendly manner. Most of the property remained as we found it, with trails meandering through untamed woods and open fields for a grazing and planting. And when planting and tending gardens, we did so organically, without sprays or chemicals. We enjoyed living in harmony with the land. We drank pure water from our deep private well and ate many of our meals from the garden. Our huge vegetable garden grew various types of tomatoes, corn, carrots, peas, green beans, cabbage, potatoes – to name just a few. We also cultivated medicinal herbs and gathered others from the wild. The land generously produced wild fruits: blueberries, raspberries, elderberries, and more. Our breakfasts included eggs lain that morning by happy hens who spend time outside. Nothing can compare with the taste and nutritional value of truly fresh food. Seasons were no longer marked by pages turned on a calendar. We lived them, experienced them in every cell of our bodies. We ate asparagus in the spring along with the power-filled herb, nettles. During winter we reaped the benefits of our labor in the gardens, eating stored food from our huge freezer and cold storage room. No matter what the season, we spent time each day outside. Nature surrounded us during strolls down the winding driveway to pick up the mail, invigorating walks through vibrant woods, and meditative moments sitting by the pond. During spring, summer, and fall we often ate outside, listening to birdsong, inhaling the sights around us. We also swam in the pond – a delightful sensory experience. Something important happened during the years that we’ve lived on this sacred land. It happened gradually, almost imperceptibly. We began feeling whole, more complete, more peaceful and serene. Harmony Farm had slowly, but surely, changed us. We attributed these changes to the healing benefits of our connection with the natural world. Full of gratitude for the abundance of our holistic haven, we expanded our hearts to further grow our dream. We decided to share our good fortune with others, give them the opportunity to experience Harmony Farm’s healing properties. We founded Harmony Center, a non-profit corporation, and built a separate building. The new building provides the ideal setting for experiential workshops and classes. People gather inside an octagonal room with views of nature visible through large expanses of glass. Two bathrooms and another multipurpose room add to its versatility. Harmony Center offers programs that facilitate physical, emotional and spiritual wellbeing in this remarkable setting. Whether someone comes for two hours or the day, it feels like a mini retreat. Upon turning into our driveway, people leave the hustle and bustle of everyday life behind. Worry and stress release as people open to the tranquility of this place. They leave feeling refreshed and renewed – at peace with themselves, at one with the world. As we moved into our elder years, we recognized that it was time for us to move on, to release old dreams and make room for the new. While this was happening, Harmony Farm began dreaming of new owner(s) / caretaker(s). A lovely young couple heard Harmony Farm’s call. These like minded souls will now care for it, love it, help it to thrive. We humans alter the Earth to suit our needs. We impact our environment, often with little thought to long term consequences. I’ve been blessed to live on 23 beautiful acres. 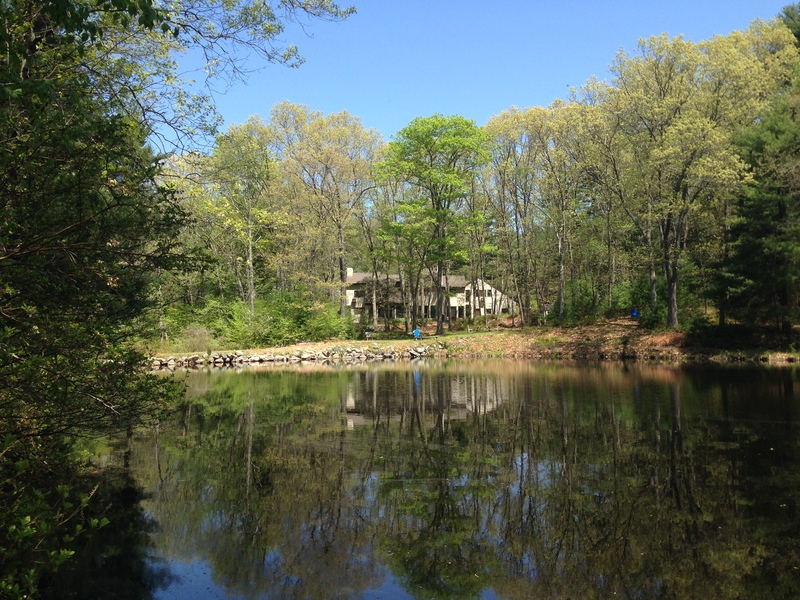 Harmony Farm’s pond, stream, woods, and fields have impacted every aspect of my being. Admittedly, we changed the land by building a house, a barn and a studio, but we tried to do so in an earth-friendly manner. When planting and tending gardens, we did so organically. While living on this small slice of nature, I spent time each day outside. My activity depended on the season. I walked trails through the woods almost every day and when snow covered the ground I did so with snowshoes. During spring summer and fall, I ate breakfast by the pond listening to birdsong, inhaling the sights around me. I also frequently swam in the pond – a delightful sensory experience. Something important happened during the 36 years that I’ve lived on this land. I changed. It happened gradually, almost imperceptibly. By spending time outside each day, I began feeling whole, more complete. More peaceful and serene. People prefer not to think about the fact that we’re destroying our life support system. Feeling helpless and scared, we protect ourselves from the awareness that we’re nearing a planetary tipping point, a point of no return for human life as we know it on Earth. This deadening of awareness prevents us from acting in ways that could create a better world, a world where people live in harmony with each other and all of Earth. Joanna Macy, an Earth activist and Buddhist scholar, proposes that active hope might enable the shift she refers to as “The Great Turning.” While she recognizes that our industrial growth society depends on the ever-increasing consumption of Earth’s resources, with corresponding ever-increasing waste products which get dumped into, around, and on our Earth, she considers this to be an extraordinary time in human history – with the potential to move from an industrial growth society to a life sustaining one. In her “work that reconnects”, Joanna guides people to acknowledge their pain for Earth and to open awareness. She invites us to release the false sense of separateness and to experience ourselves as interconnected, part of the web of life, members of Earth’s community. 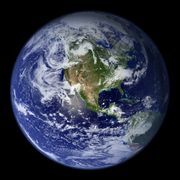 The Great Turning requires that we take responsibility for what is happening on Earth. This entails releasing old structures and enabling life sustaining ways of being to emerge. It involves creating a new world. In this new world, partnership and cooperation will replace competition and strife, empathy and compassion will replace hostility and aggression, generosity and sharing will replace selfishness and greed, and the power of love will replace the power of force. We will move away from striving toward perfection and aim to grow into wholeness. Rather than disconnection and separateness, we will experience ourselves as integral members of the web of life. Holding hope for the future, let us join together and help create this better world. Many years ago I read “A Circle of Stones” by Judith Duerk. The repetitive “How might your life have been different if there had been a place for you, a place for you to go to be with…” evoked a sense of longing in me. It spoke to the need for women to gather in community, to share their stories with each other, and to support each other’s journey to wholeness. “What if there was a place…” “What if there was a place…” This phrase rooted itself in my heart, silently waiting for the right time to echo forth. On walks in the woods, I felt the land offering to be that place … a place where people could commune with nature, connect with each other, and help each other to grow. “How might that happen?” I wondered to myself, as well as the land. Year after year, “How might that happen?” continued surfacing in my mind. Then my parents died. After my sadness abated, which took a couple of years, I realized that the money they left might just cover the expenses of erecting a building. But in order for it to be built, a large and stately pine tree would need to be chopped down. My husband and I debated about Grandmother Pine. She felt sacred. We wanted her to stay. Yet forced to choose between the building and the pine tree, we ultimately opted for the building – with one condition. Grandmother Pine’s stump would need to stay. I wanted Grandmother Pine to be remembered. While the building was under construction, a fluorescent yellow ribbon with the word “CAUTION” circled the stump, alerting all contractors to exercise care when navigating machinery in the area. I removed the ribbon once Harmony Center came into being. I thought of the stump as an altar, and sometimes placed ceremonial objects either on her or around her. For the most part, however, Grandmother Pine’s memorial remained undecorated. 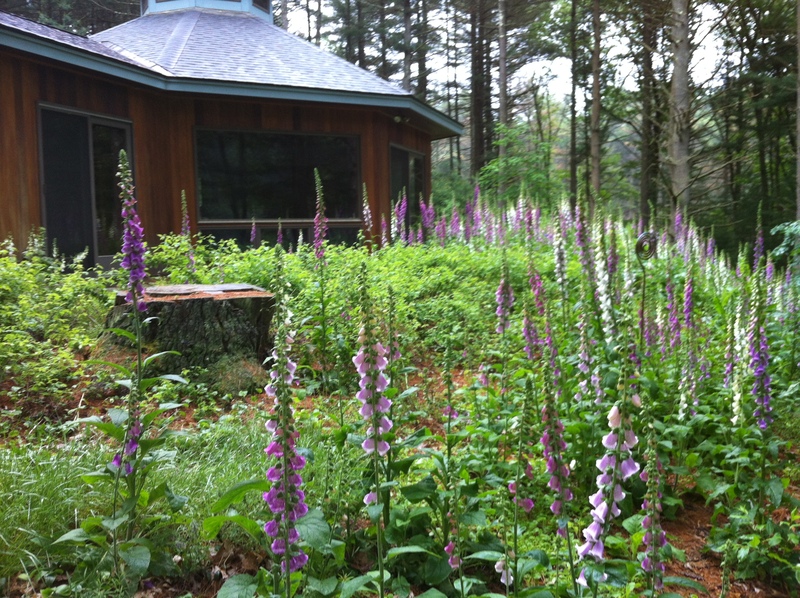 This summer, when Foxglove surrounded her with loving energy, it felt as if they were honoring Grandmother Pine. At this year’s Fall Equinox, I placed a sunflower at her base. Then recently, I stood contemplating her flat top, asking how she might like to be honored, and suddenly thought, “A Circle of Stones! Grandmother Pine gave her life so we could have that place, a place to gather in community. A circle of stones would honor the sacrifice she made.” And with this thought an image came to mind – a circle of stones around a rock cairn on top of the stump. I walked around, gathering stones from various places on the land. As always, I checked in with each stone, making sure it wanted to be part of this altar. Then I placed larger ones in the middle creating the cairn, and around the cairn a circle of stones. Completing my mission, I stood back to take a look. 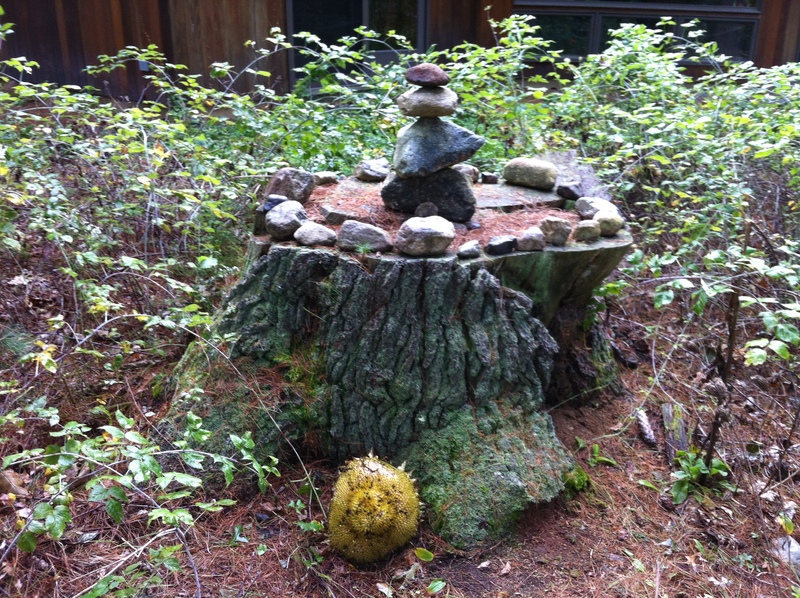 I saw the cairn as a new being growing up from the center of the stump. And around this being, a stone circle creating sacred space within which this being can grow. Thanks to Grandmother Pine, we now have that place, a place where people gather in community–Harmony Center. Spring springs forth with great abandon and joy. Each day brings new surprises as Earth’s creative energy finds expression everywhere I look. The landscape grows greener day by day. Green shoots break through the ground, then rapidly uncoil to rise further up, moving toward the sun. Leaves sprout forth from trunk and stem, then expand outward. A chicken sits on eggs in the barn. Usually hens roost at night – which means that they perch on an above-ground structure. When a hen “goes broody,” she first remains in the nest, sitting on her eggs, for longer and longer each day, and then starts spending the night there. She patiently sits, day after day, only getting up now and again to take a few sips of water and eat a few morsels of food. Beneath her warming body, baby chicks are forming. 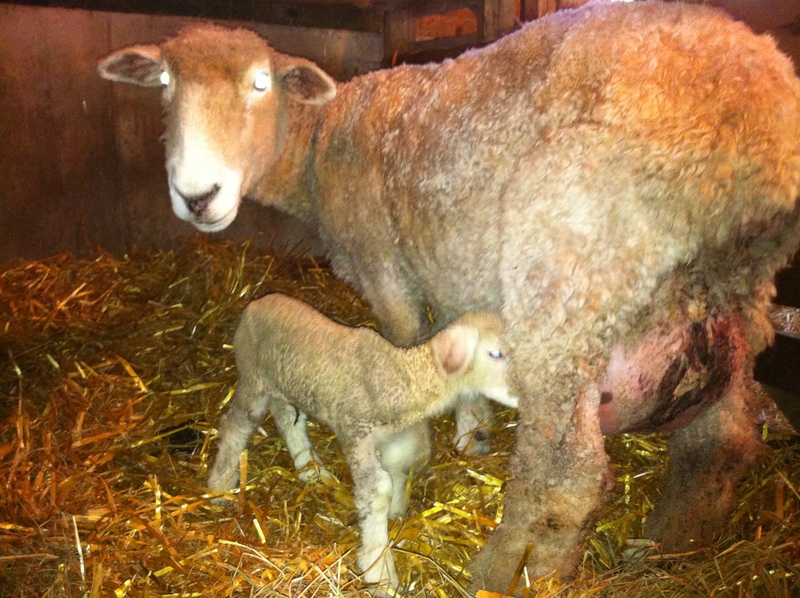 A ewe birthed a beautiful baby lamb last night. She carefully licked it off, and immediately began nurturing it. When I saw them together this morning, the lamb was standing on long scrawny legs sucking milk from her mother’s teat. I too feel Earth’s creative surge. My fingers twitch with joy as I head out to plant a package of seeds. Earth will nurture these seeds. When the time is right, the seeds will germinate, and follow inner directives to send roots down deeper, push heads up higher, branch out in all directions, flower and bear fruit. We similarly receive inner directives to grow. Growth takes us in many directions: into the soil of our deeper selves, out toward other beings and all of Earth, also up toward the light. Following inner directives helps us grow into wholeness.